Discernment Ministries held a very special research conference in Niles, Michigan June 21-23. Niles is the new home of our ministry’s library, the Opal Reddin Library, which archives over 40 years of research material in the Latter Rain, Dominionism, Third Wave and New Apostolic Reformation. · The emerging eschatology involving the return of space alien creatures, Nephilim and Mayan legends in December 2012. · The rise of Quantum Spirituality, merging quantum physics with eastern mysticism and postmodern evangelicalism. · Technocracy and Transhumanism and how this is changing the church and the world. · The latest research on the New Apostolic Reformation and the Latter Rain false apostles and prophets. · How Hollywood is being used by the Quantum Spirituality advocates to create stimulating new imagery to promote pagan mythologies and idolatries. · How evangelical leaders are using ancient occult writings, apocryphal writings, astrology and modern UFO lore to build upon Scripture. This research conference was based on the topics that we have been covering this past year on Herescope concerning the rise of a new eschatology, including the recent series "COSMS, CODES, AND CRYPTOLOGIES." All the speakers were absolutely what God intended and as they wove each part of their presentation, it became a huge whole... how blessed we were. How very much I want to thank you for your listening to The Holy Spirit's leading to put this conference together, and for His strengthening each speaker to be emboldened and to speak. They were clear. They were encouraging and edifying, and in the last part, Warren Smith brought it all together in God's perfect comfort. Thank you, thank you. The talks were riveting and the presentations included many visual illustrations. These have all been professionally edited and packaged into a seamless filmed presentation that enables you to view the graphic images and overhead documentation while the speaker is talking about the topic. It is very user-friendly and makes it easy to understand the topics. These high quality filmed conference presentations are available on DVD. Audio CDs are also available. 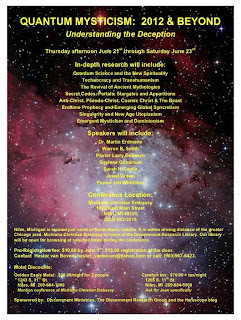 and scroll down to C245 Quantum Mysticism conference information.